Although we had a wonderfully snow-free winter (almost, except for the freaky Halloween and one other little storm), I always look forward to the warm weather, swimming, barbequing, sailing and just enjoying going outside without a coat! I’ve already been in our pool – the water temp got up to 79 degrees (and I know that most of you have to wait til it’s high 80s and above) – but I just had to kick start summer by jumping in.So, my house had to get a summer thing going on…and the first place is the mantle! Since we live a block and a half from water, I had to add some sea fans, starfish and coral. And – the birds are a must. My husband’s favorites are the small piping plovers, which are endangered here on Long Island. I picked up the bird carvings last summer when I went to pick up an outdoor rattan seating group on Craigslist. The young man selling me the rattan told me that he had some other items from his dad’s house that he needed to get rid of and so…of course I had to take a look. The carvings, done by his father, were sitting in dusty boxes but I could see they were wonderful. 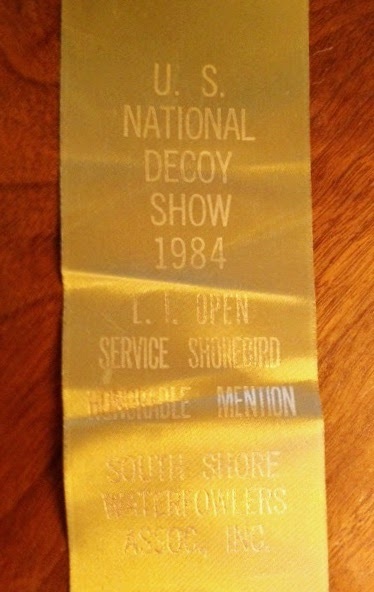 In fact, one of them got an Honorable Mention in a National Decoy Show. Here’s the winner! My husband’s favorite. And whenever I decorate anything in my house, there always has to be things that jog my memory and bring me back to a different time in my life. One of these is the centerpiece, the framed antique print. I’ve had this since about 1979 and I bought it in Manhattan at the Argosy Bookstore on 59th Street. The Argosy, still in business after 87 years, is a treasure trove of old prints and books that I always loved to browse in. 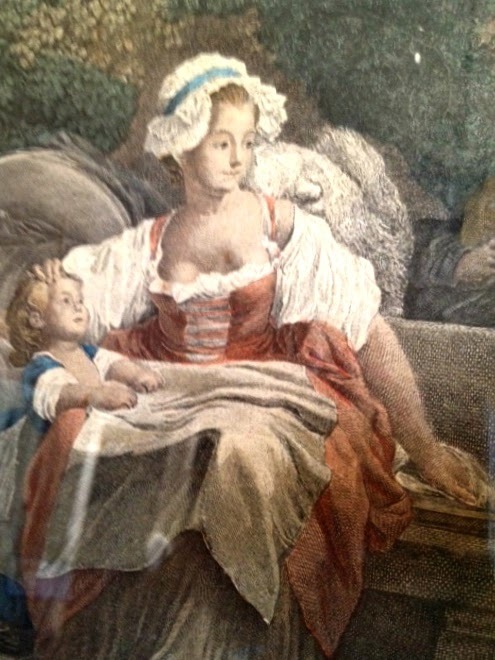 Back then I only had a little bit of money to spend on artwork – but this wasn’t too expensive and it reminded me of myself with my children. I was a single mom then and this image helped get me through some hard times. I didn’t even have the money to get it framed but years later a wonderful boyfriend got it framed for me. It was done beautifully with an gold and antique blue frame – which used to go with my living room furniture. But in my home now, I had to re-stain the frame in an antique green to blend better with the decor on the mantle. And the urns? Well, these were the first things I bought at the New York Gift Show when I went into the design field. 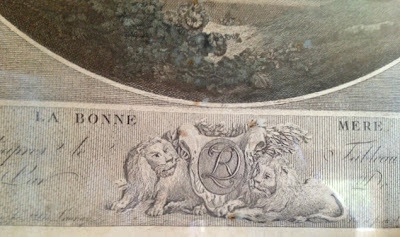 They look antique (although they aren’t) and the landscapes on them seem to go well with my antique print. So, I hope you enjoyed my little homage to summer (with some of my memories thrown in!). You might also enjoy reading how I created the mantle and gilded and antiqued it. Click here to read about it! I am sharing this project with…. Your mantel is beautiful. Love the coastal items. I love coral and sea fans and have a few, but would love more. Thanks for the advice on my mantel. That applique is pretty light now and not sure if I want it to stand out or not. I did have it darker when it was just Co Co.
Oh, and I really don't even like the applique. My husband added that and I really want to replace it. I hope it isn't too hard to remove. Oh how blessed you are to live so close to the water! And those decoys… such treasures! I love how you were able to incorporate the art work that means so much to you, as an artist it just makes me smile! Display what you love, it makes your place so much more meaningful! Have a wonderful weekend! Thanks for taking us into your home, Linda! I always love hearing the stories behind the object, especially when they have such meaning. The unspoken message is the story of how you've made your house your home. It's a wonderful story! Wow that is gorgeous! Thanks for stopping by my blog. Now I can admire all of your beautiful creations! Your collected mantle is just beautiful. 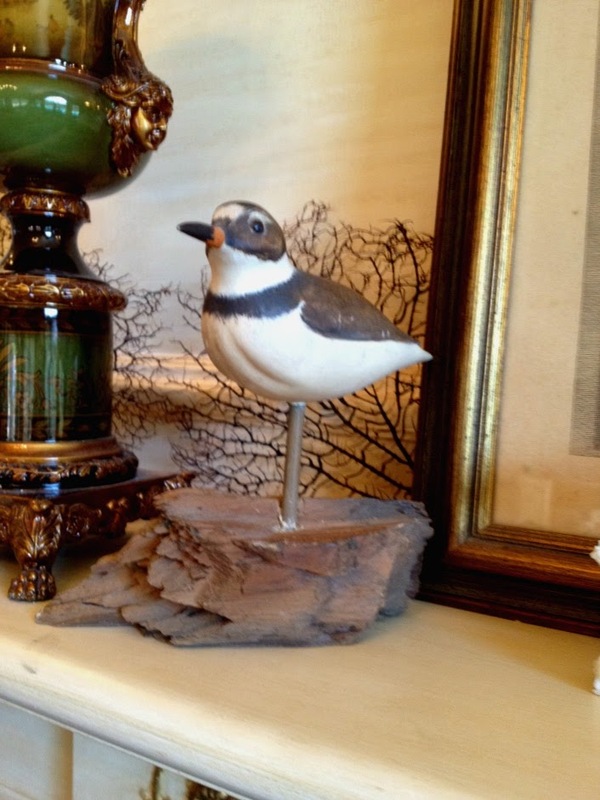 So glad you were able to rescue and display the beautiful bird carvings! This mantle looks amazing. 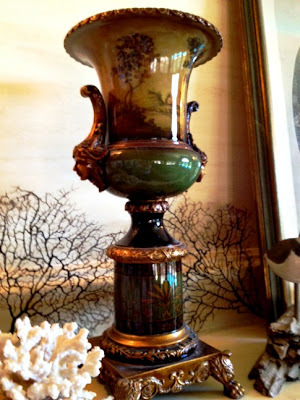 Those urns set the stage and then you added so many things that truly made it pop! You have a really good eye for design. Thanks for the wonderful comment on my blog because it led me over here! What a lovely summer mantle! 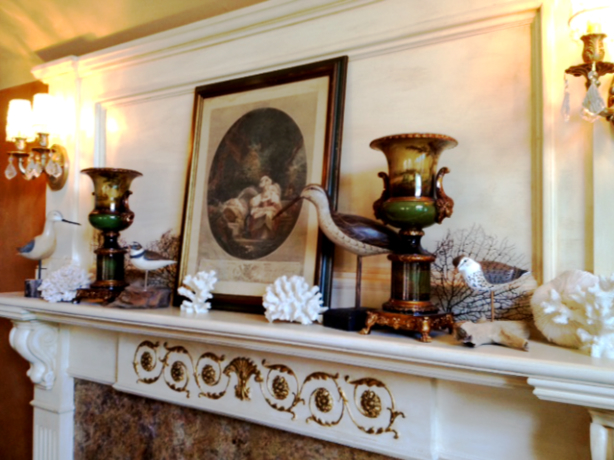 Your mantle is absolutely goregous! I love the birds. 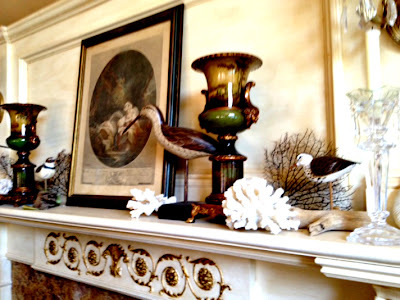 Your summer mantel is gorgeous, and I love the stories behind each of the pieces. 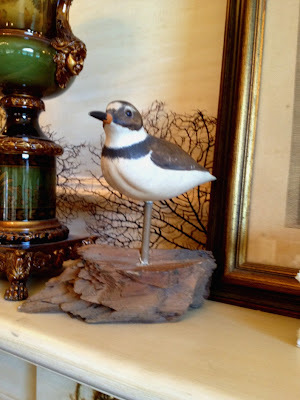 Thanks for visiting my blog and my summer mantel! 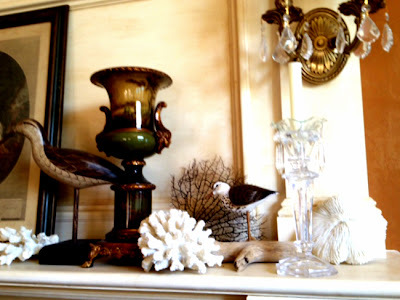 LOVE your mantel!! It's such a different style that I have been seeing lately! LOVE IT! What a lovely Summer mantel! I love the touch of coral and sea fans. So pretty! Thanks Emily! 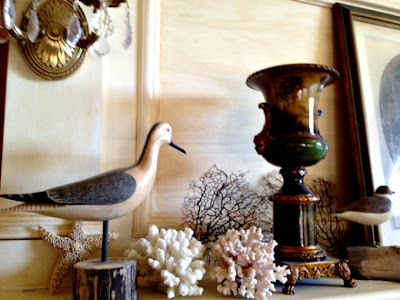 I’m assembling items for a fall mantle and I will post that on your site as well. You give all of your readers such great ideas – thank you for that!